Sometimes, a distinctive sword needs a distinctive display. And if that sword happens to be a Japanese katana or tachi, than this Vertical Shogun Sword Stand is the perfect way to show it off, by creating a truly unique standing sword display. This attractive sword stand is made specifically for the Japanese sword, particularly those of a curved nature, like the famous katana or the earlier tachi. The stand is made from black lacquered hardwood and features a rectangular base set with small slats that act as feet. The base features a small indenture for sheaths base (known as a kojiri). The stand also features a tall, 24 inch tall rise, capped with a rest that helps to keep the sword aligned and up-right. 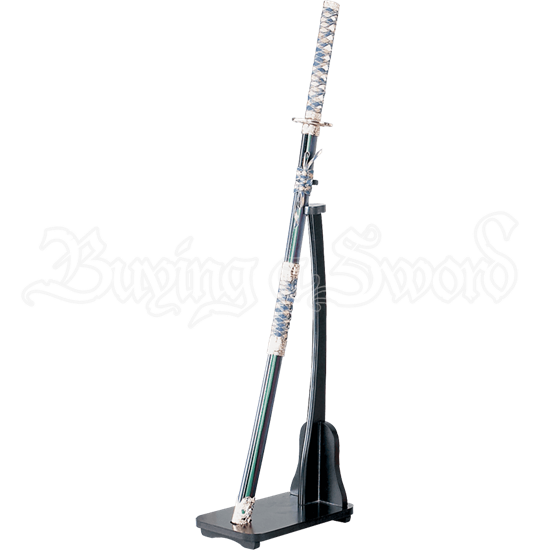 The end result is that any sword displayed properly in this stand is stood vertically, for all to see and enjoy. As its name implies, this Vertical Shogun Sword Stand recalls the look of a Shoguns stand from history, allowing any warlord to keep their favored sword close at hand, displayed and ready for easy grabbing.